Intel In The Big Dance – March Madness! One of the really great things about working at Intel is the fact that I get to work on some amazing programs. As a GIGANTIC sports fan and an ardent user of great technology, I have been spoiled this year. Not only are we announcing and launching a new family of Intel Core processors, we are doing so around major events in the first half of the year. First, there was the Super Bowl. Next was last Sunday’s first ever foray in the Academy Awards. Starting this Sunday, we are unveiling a major relationship with CBS and their coverage of the NCAA Men’s Basketball Tourney – aka, March Madness. 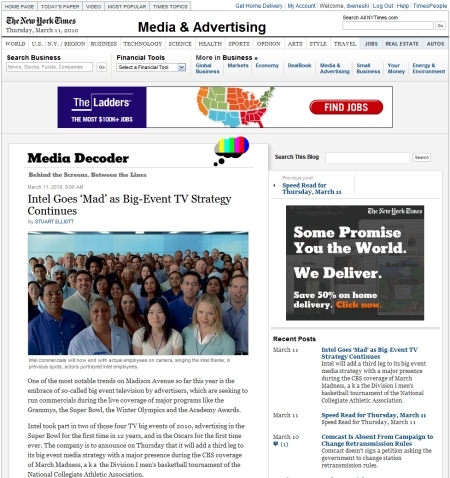 Don’t let me tell the tale, rather read what Stuart Elliott’s (New York Times Advertising columnist) take in today’s Media Decoder blog. We’re very happy with this coverage – Mr. Elliott did a nice job capturing the essence of a very complicated integrated media effort. I’ll be watching the whole tourney – from Selection Sunday, to the Play-In game, the National Championship game on April 5th in Indianapolis. I am a big fan of media partners that go the extra mile to make an experience good for the client. We recently did a pretty cool execution with Digg around our new product announcement at CES. We worked with Chas Edwards and the Digg team to create ‘content’ ads and ‘digg’ ads that offered up a great value to the customer – aggregation of the best stories coming out of CES, in multiple places our target audience consumes content. Yep – that’s right – we aren’t forcing them to come to Intel.com, rather, we’ll bring that content directly to them…wherever they are by offering a teaser link that drives them to a content hub on Digg (see below, credit ChasNote). As I’ve stated before, driving people to Intel.com is not my first priority. Bringing them great content (from Intel) in their natural browsing path, is. We’ve done that in our program with Digg. It’s Monday, Consumer Electronics Show is over, we’re all back from Vegas and best of all – we unveiled our latest line of processors that are set to turn your computers into the ‘smartest’ PC on the block. 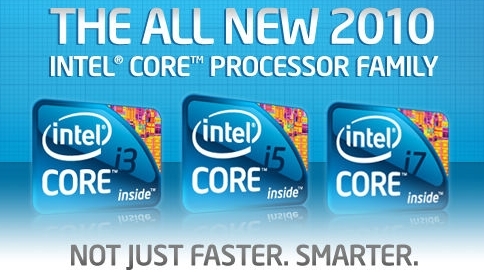 On January 7th, our CEO announced our latest family of ‘Core’ processors at his CES Keynote – the all new 2010 Intel® Core™ processor family featuring the trio of i3, i5, and i7. The reviews are in from several of the major review sites and, from the word go – it’s a smashing success. From my read of Anand Lal Shimpi’s review the biggest ‘feature’ of the new Core i5 processor (‘Arrandale’) is the vastly improved performance. Anand has been reviewing our technology for a long time and, in my opinion, is one of the best at providing a comprehensive and detail rich review of each sku we release. This round of reviews does not disappoint. As always, Engadget has the most comprehensive blog post about Paul’s Keynote @ CES, and a quick search on Twitter reveals that the buzz about our new processor family was at it’s peak during the show and continues on even after the ubergeeks have left Sin City. The only question left – When are YOU upgrading?